Don’t Be Afraid to Look at Your Options! Making the Maven Episode 134: There are a lot more options out there than you think. Holly Bertone has an amazing and beautiful story to share. First of all, she is both a breast cancer and Hashimoto’s survivor. She is Founder of Pink Fortitude and the Author of Thriving in the Workforce with Autoimmune Disease, which is also an Amazon Bestseller. Holly has been through so much and had to drastically shift the way she works because of her illnesses. As someone with an autoimmune disease, she is all too familiar with what it was like dealing with coworkers and bosses who simply did not believe you’re sick. Find out more about Holly Bertone and her journey on today’s episode. *People with autoimmune disease, especially in the workplace, are silently suffering from this. *Holly started her blog as a side hobby while she was diagnosed with breast cancer. 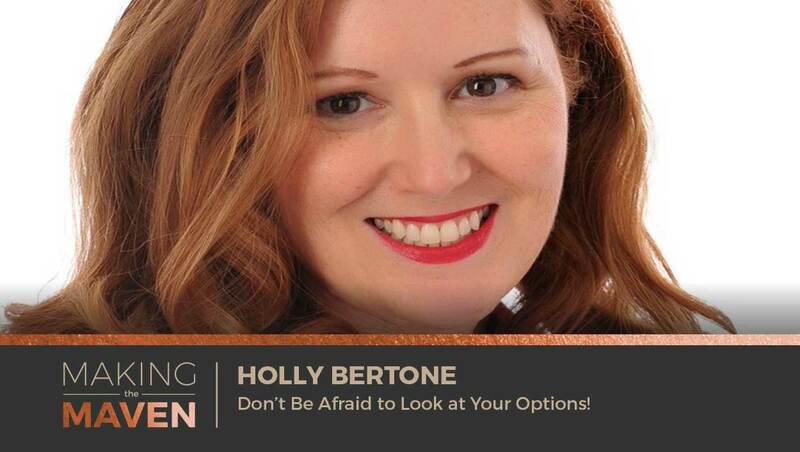 *How did Holly Bertone first get started along this path? *Holly was 39 years old when she was diagnosed with breast cancer, and then she was also diagnosed with Hashimoto’s disease. *Holly really could not do it all. She had to take a step back from her job in order to recover properly. *The universe gives you signs. *What is Holly up to now? *Holly felt like a failure. She had to give up on her life’s work and she felt like she let herself and her family down. *When Holly was going through this, she found out there were very few resources for people who have autoimmune disease in the workplace. *How many people are silently suffering everyday just because people don’t believe their illness is real? *What has the response been like as the result of the work, and the book, Holly has done? *If you’re having health challenges, put a financial/career/life plan together. Really think hard to come up with a game plan and work with what you got. *Don’t be afraid to look at your options. There’s a lot more out there than you think. *What advice does Holly have for those just starting out? *Holly had to completely shift how she worked on a daily basis after she was diagnosed with cancer. She couldn’t ‘charge’ at the problems anymore with the energy that she had. Making the Maven Episode 133: Fear is a habit, but the good news is, you can change it so that you live your most authentic self. Kate Swoboda is the Author of The Courage Habit and she is an expert on habit-formation and building psychological courage. Fear-based behaviors can become habitual, but this means that you can also develop courageous-based behaviors too! Fear will always come up in your life, whether you’re launching a new product, book, or service, fear will be there. The good news is, you can change the way you feel about fear so that it benefits you. 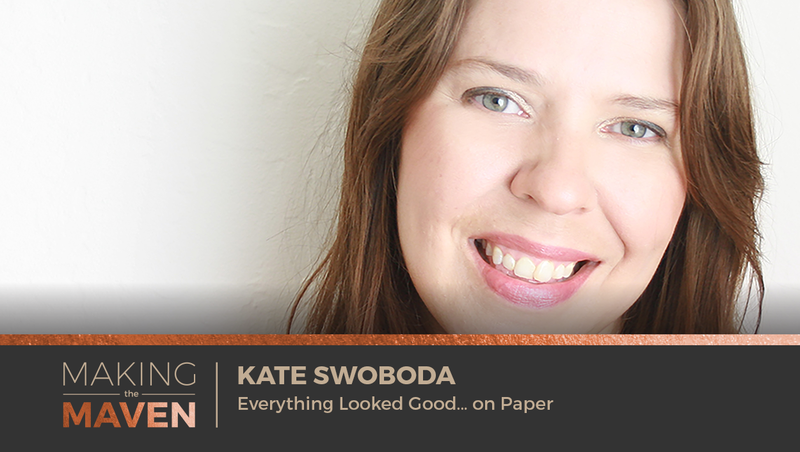 Find out more from the very wise Kate Swoboda on this week’s episode! *Everybody struggles with fear… and that’s okay! Kate dives into why you have to face your fears today. *How did Kate get started? *You will never be able to fully get rid of fear but what you can do is get present and not let the fear control you. *If fear-based behaviors can become habitual, then that means courageous-based behaviors can too. *At least half of our behavior every day is habitual. We are very predictable and that’s not always a bad thing. However, it’s bad when we let habits go on autopilot. *The good news is you can break the habit! *What is your fear routine? *What finally got Kate to face her fears and create change in her life? *Kate thought she was making all the right decisions. How was it that she wasn’t happy when she made them so consciously and deliberately? *What was Kate’s biggest struggle when she first got started working for herself? *Making six figures in six weeks is a lottery ticket. For most entrepreneurs, it’s a grind and it takes time to see success. *Don’t compare other people’s success to where you are. Everybody starts at a different point in their entrepreneurial journey. Making the Maven Episode 132: It can be easy to focus on your end-goal, but don’t ignore the red flags as you’re working towards it. Amy Lasseter has over 11 years of experience in the professional field of mental health and seven years of experience working in her own business. She built a successful group practice while juggling a growing family and then burned it all down when it was no longer serving her! Amy Lasseter discusses her experiences and why she felt so isolated and frustrated with her brick-and-mortar business. Through professional consulting and coaching, Amy now understands how easy it is to build your dream business while still maintaining the level of freedom you desire. *I’m excited to share Amy’s story with you! She is a client of mine and has seen so much success. 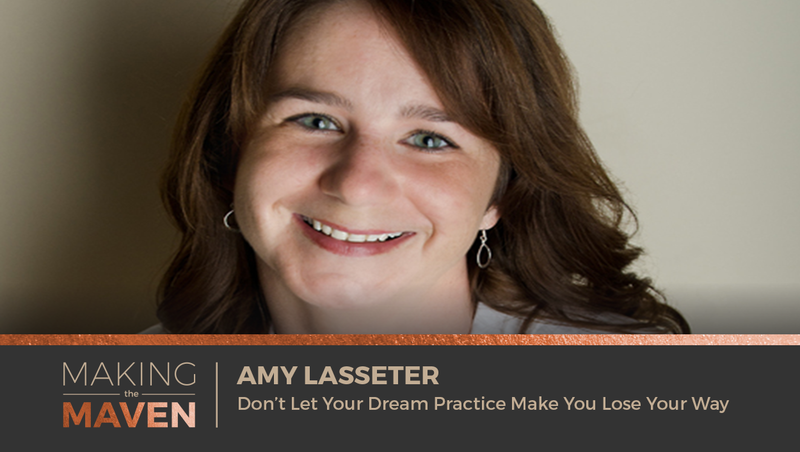 *How did Amy Lasseter first get started in her practice? *Was it difficult for Amy to become her own boss for the very first time? *It took Amy about 4 months to make her first $600 dollars. *What did Amy’s husband think about all of this? Getting the spouse on board is almost half the battle. *There were a lot of things weighing against Amy as she was starting her business. How did she overcome all these different roadblocks? *How did Amy’s group practice begin? *Why did Amy decide to close her practice down after three years? *Amy discusses some of the red flags that flew by her and that she completely missed. Hindsight is 20/20. *By the time Amy connected with me, she was so frustrated and struggling underneath the weight of the business. *Amy felt like she was half-assing it and she was not okay with that. Something had to change and that became very a painful transition for her to do. *Sometimes you can’t even hear your own voice when you’re so outward focused and set on pleasing everyone else around you. *Get a coach. It’s so, so lonely at the top. Amy felt so isolated throughout her group practice journey. *What is Amy up to now? You can find her in the Facebook group, BreakThrough to Your Growth & Success. Making the Maven Episode 131: Get through your blocks and start LIVING a truly meaningful and inspiring life. Jen Mavros is a modern-day Spiritual Messenger, the host of The Jen Mavros Show, and the creator of The Mavros Method of Manifestation. Her work has helped 5900+ of purpose-driven entrepreneurs discover and live the life they truly desire. On the show, Jen shares how she went from a hot mess to someone with a thriving career, soulmate, and living life with impactful and meaningful purpose. She also shares steps you can take to manifest your desires and make your dreams finally come true. Do not miss out! *Hey! I would love for you to leave a review for the show! *How did Jen first get started in her career? *Prior to learning about manifestation, Jen’s life was a hot mess. *For most of us, we don’t change until we absolutely have to. *Life really began to change when Jen discovered the teachings of Louise Hay. *When did Jen turn her intuitive powers into a career? What was that transition like? *When you’re out of aliment, life has a really beautiful way of supporting you and course correcting. *Jen shares the defining moment that made her decide to change her career and take a leap of faith. *What does Jen’s soulmate think about all of this ‘woo-woo’ stuff? *Jen discusses the mindset you need to have when going from employee to entrepreneur. *Jen shares advice on steps you can take to manifest an amazing life. *What’s the most important to you right now? *How do you define success? Making the Maven Episode 130: Where does healing really come from? Razi Berry is the Co-Founder of Naturopathic Doctor News & Review (NDNR) and Founder of NaturalPath. At 25 years old, Razi was sick and going from doctor to doctor trying to find out why. No one could help and it got so bad that she decided it was time to fire all of them and start fresh… and that’s how she found homeopathy. Razi Berry started NDNR 14 years ago when she was fed up that there wasn’t an official journal showing case studies of how, and why, homeopathy works. On today’s show, Razi discusses the difference between a community and a movement, where she sees the wellness industry going, and why healing happens within yourself. *Thank you, Jessica, for your awesome review! *Razi Berry starts her morning every day by hugging a tree in her yard. *Razi used to look at her phone every morning instead and it really set a bad tone for her. *Tree hugging isn’t some ‘woowoo’ thing. There’s actually real science behind this. *Was Razi always like this as a child? How did she get started as a homeopath? *Where does healing really come from? It doesn’t come from the doctor. *Why did Razi decide to start NDNR? *With so much information out there, people are very distrustful (and with good reason). It’s more critical than ever to understand what motivates someone into taking action. *Razi is not just creating a community, she’s creating a movement. What’s the difference between creating a community vs. creating a movement? *Razi discusses some of her fears about Western medicine overtaking traditional/natural medicine. *Razi has a gift for you!! Stay until the end to hear what that is.